We are a prominent manufacturer and wholesaler of PP Moulded Products. Our product range also comprises of Fume Hoods, Industrial Filters and Plastic Products. These products have most demand in market. These products are made from high quality raw material. These products have long life and best in industry. Our Scrappers/Spatulas & Scoop are manufacture from virgin polypropylene & having good mechanical strength & unbreakable handle. 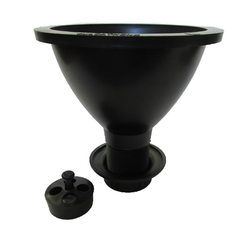 These strainers are used for filtration application in pressure sand filter, carbon filter, softener etc. The moc of strainers are made out of pp which is suitable for drinking water application and resist corrosion having good mechanical strength also these strainers can be made out in different grade of material based on client's application. These strainers are installed on strainer as plate design and header lateral system for distribution & collection purpose. These strainers are providing very good flow rate and by which it improves the backwash and filtration efficiency of the plant. So as to fulfill the rising desires of our honored patrons, we are dedicatedly instrumental in offering a finest class PP Tray.